Stefana (Greek Wedding Crowns) are used to crown the bride and groom in a traditional Orthodox wedding ceremony, symbolizing the combination of their lives as one, becoming the King and Queen of their Household. 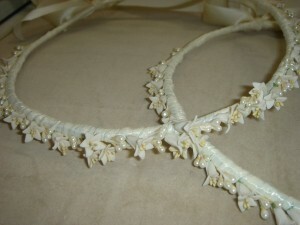 These crowns represent the signs of wisdom, justice, integrity, glory and honor. After the wedding ceremony the Stefana are kept safe in a box, called the stefanothiki, representing the couple's commitment to each other. In Ancient Greece times, Stefana were made with olive branches, vines and lemon blossoms, in honour of the goddess Aphrodite. Today, they are made of precious metals, semiprecious stones, crystals and pearls and porcelain leaves and flowers to ensure they last a lifetime. The Perfect Occasion is proud of their own designs of Stefana, both in traditional and modern influence with high quality in craftsmanship and fine ribbons joining the Stefana together. In addition we also offer WHOLESALE services for our Stefana, so retailers please enquire with our management.